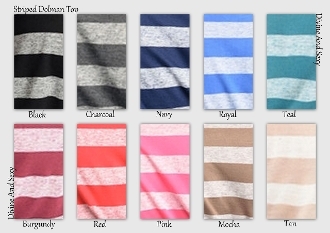 Striped Dolman Top. This knit striped top features a banded hem and short batwing sleeves. Super soft, will look great with any accessories. 85% polyester, 15% spandex. Made in the USA. Comes in colors: Charcoal; Tan; Pink; Red; Black; Royal; Mocha; Navy; Burgundy; Teal. Comes in sizes: Small; Medium; Large.